They are available in our classic grosgrain trims in Navy, Aquamarine or Silver but watch out for our seasonal shades such as Blush, Verbena or our "wake me up" popular shade, the neon Tequila. 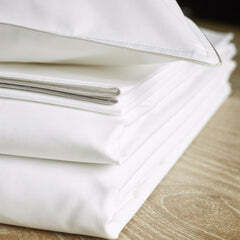 Personalization: our pillowcases can be customized with your very own monogram. Choose initials or words of up to 8 letters. To make our products unique, you can choose between 3 fonts and 12 colours, all available in a chic matt finish.- Just contact us via the notes (a box will appear at the checkout) if you need more space! 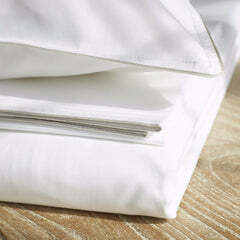 Monograms are positioned in the outer bottom corner of pillowcases so they can be visible, yet discreet. Sizing (unless specified otherwise in the checkout notes) is 2 cm height. A chic monogram or fun message creates a thoughtful and elegant gift as all our monogrammed items are delivered beautifully gift-wrapped, at no extra cost. Simply wash at 40 - 60 degrees and tumble or line dry! Just remember to wash preferably with other cotton whites and avoid all softeners. 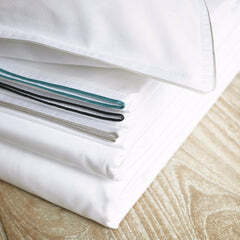 To make ironing a breeze... either iron your linen when it is slightly damp still or use starch if you like your linen ultra crisp... that's it! Draper London delivers throughout the UK and internationally. We offer complimentary delivery for all orders above £125 to the UK, as well as free returns in the UK. See below for further information on delivery methods, costs and delivery times. We aim to dispatch orders placed before 12 noon on the same day. Orders are shipped between Monday - Friday, not including Bank Holidays. Tracking information will be sent to ensure delivery at a convenient time. Although we use all reasonable means to ensure that your order is delivered within a specified time, we cannot accept any responsibility for late deliveries due to circumstances outside of our control but we will always do our best to inform you of any unexpected delay! You have just realized that you have purchased the wrong size or you have received an unwanted gift.... no problem! You can return any item within 30 days of receipt, as long as it is unused and in its original packaging. Please inform us of your intent to return your purchase and the reason why, by contacting us at customercare@draperlondon.com or calling us on +44 (0) 1635 200 800, Monday to Friday, from 9am to 5pm. Please remember to quote your order number! We will then arrange a collection at your specified UK location and refund your purchase as soon as we receive the item. We cannot currently offer free returns to International customers but they should contact us at customercare@draperlondon.com, as above, to organize the return. The product has been successfully added to your shopping bag.